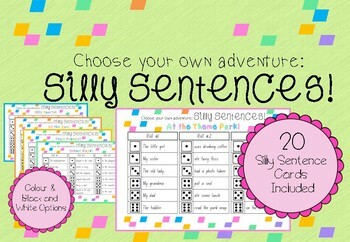 Choose Your Own Adventure Silly Sentences! Inspired by those 'Choose Your Own Adventure' chapter books I loved reading as a kid, this stems from that exciting concept of not knowing where you're going to end up next, but in this case, not knowing where the next part of the sentence is going to head. 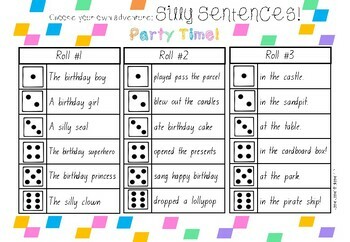 Their fate is determined by rolling three dice to discover their sentence. 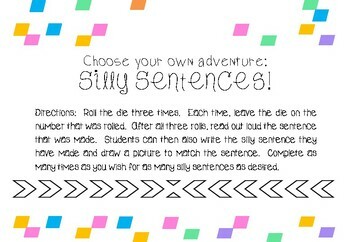 Once students have written their sentence, they then draw a picture to match their crazy sentence. There are 20 different topic sheets included with black and white and colour options available. 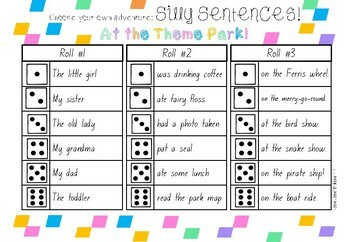 My students have loved this resource, developing their ability to craft sentences in a hilarious way. It makes your most reluctant writers engaged!